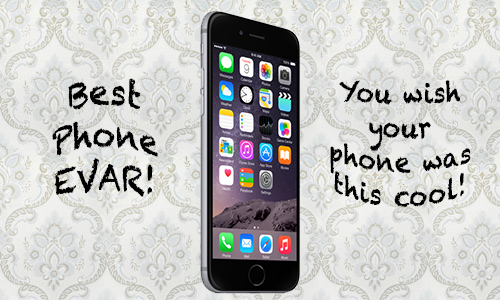 The iPhone 6 is the best smartphone ever made. You’re only here for two reasons. Admit it. You either agree with that statement or you hate everything about it and you’re here to give me grief. Well, truth be told – I don’t even own one yet. I haven’t held it’s beautiful space gray body in my hands or caressed it’s lovely retina face with my fingers… But it doesn’t matter. It’s the greatest phone ever made, hands down. And not because I’m a self proclaimed Apple Fanboy. While I won’t go back to the history of mobile phones, handheld devices, or even companies such as Apple, Google and Microsoft, I think it’s an important part of the conversation to discuss how in the mid -2000s things got interesting really really fast. The Mac vs PC commercials are still fresh in our heads today. I think about how Apple was very deliberate in brining down the home market share of personal computing with those ads and how they were continuously poking fun at PC companies or their big target: Microsoft Windows (XP/Vista). They were doing their darndest to make people believe that Macs were better for every day life. Then in 2007, Apple dove headfirst in the phone market by releasing the iPhone. What a complete 180 did they decide to do with this from a marketing perspective. I cannot recall one ad that contained anything negative about the competitors. That being said, every keynote by Jobs or Cook since has contained a jab or two at either BlackBerry or Android. This strategy seemed to permeate right through to iPad as well. The ads for iPhone and iPad became about what you could do and how you could use it instead of attack ads. I found that suspiciously fascinating. I love Android. Make no mistake about it. Without Android OR Apple we wouldn’t continue to strive for innovation and push for the best possible technology out there. Without getting overly geeky – that A8 chip on the iPhone 6 might have never been if it weren’t for competition. I relish it. I welcome it. That’s why we build apps for both at Bromance Labs. As long as people are using the devices, we’ll keep writing software for them. And we like it that way! The tables have seemed to turn to Apple’s competition however, from a marketing perspective. Look at this new ad from Samsung mocking the iPhone 6 and 6+ release. While I think that Samsung’s tactics are a little more deliberate and sound a bit whiny in contrast to the comedic Mac vs PC – I can’t blame them! Apple has reported 4 million units of the iPhone 6 preorders in the first 24 hours alone. They are consistently outselling Samsung quietly and therefore have no reason to make ads that target their competition. That would be in very poor taste. While I understand that this might read as a pro-Apple article, I wanted to write it for a specific reason: to get people to stop whining about how awesome their phone is. If you’re happy with your Galaxy, Nexus, iPhone, Note, BlackBerry, Lumia, or Palm Pilot that’s great. I’d rather know about how you use your phone on a daily basis and why you like your phone. Not a “my phone did that first” or “but my phone does it better” story – leave the advertising to the marketing cannibals at Apple and Samsung and Google, etc. PS: I don’t really think it’s the best phone every made, but it sure keeps people pushing for better tech; I’m all for that! What phone do you have? Do you love it or hate it? What phone do you want and why? Let us know!